Ben Canty died aged just six years old. His organs were donated to five other people. BEN CANTY WAS a normal, happy boy who went through a lot in his short life of six years, including an usual early-age stroke. “Because of him, five people are leading better lives,” said his father, Bryan Canty. Ben was himself waiting for a liver transplant in London when he died. Sadly he passed away at Kings College and his organs were donated instead. 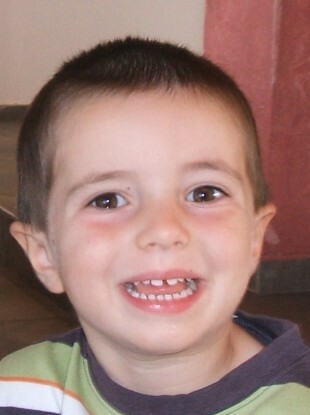 Ben died in October 2013 at the young age of six. “Ben was just like any other child, but at two and a half, we noticed something wrong. He had a limp and his hand stopped working one day,” said Bryan, who said their GP sent him to hospital. The family were seen quickly, but soon a number of doctors were standing around Ben. “I was standing behind Ben with my hands on his shoulders. The senior paediatrician asked did Ben normally smile like that. I laughed, thinking he was referring to his cheeky grin, but when I looked I could see one side of his face had levelled,” he said. After a number of tests, Ben’s parents were told he had had a stroke. Ben was transferred to Temple Street Children’s Hospital, however, the neurosurgeon said that the bleed had stopped and that it was a very dangerous operation. He said he may not have another bleed again. The family returned to Cork where he underwent physiotherapy up to three times a week. A year or so later, Bryan noticed a slight abnormality with Ben’s eye. He underwent an MRI and the doctors said he had had another bleed. Ben returned to Temple Street where a decision was made that they would have to operate. He recovered so well. He was in and out and the surgeon was happy with how it all went. We began leading a normal life again. He was in the local Gaelscoil and enjoying life, like a normal little boy. On 7 October 2013, we had been out playing with his kites before bed. I heard him retching in bed at about 10.45pm and ran into his room. I brought him in to our room, he was still fairly lucid, but he was able to tell us he was fine. Ben then began to have a seizure, something they had been told could happen after the operation. It was absolutely major. It took about 45 minutes for an ambulance to get to us. I carried him out to the ambulance and they started to work on him. Ben’s seizure didn’t stop until one hour and 40 minutes later. His temperature reached 42 degrees and he was placed on a ventilator. The next morning we were told that his liver had started to deteriorate. They said it could have been because of all the medications he was on to stop the seizure or it could have been the rise in temperature. Ben was transferred to Crumlin Hosptial where the family were told he would have to go to the UK for a liver transplant as paediatric transplants don’t take place in Ireland. When he arrived in the UK he was taken to critical care and monitored. “We filled out the transplant forms and we were told that his liver had come to the brink,” said his father. However, out of no where, his liver began to show improvements and the family were told that a transplant may not be necessary. Ben was put back in a coma and when an ECG was carried out on him the family were told there was no brain activity. “We were told he was brain dead,” said Bryan, who said they were told when the machines were turned off, that would be the end. We want to tell Ben’s story as it is important to highlight the importance of organ donation. People always say we were very brave, but anyone in our situation would have done the same, I think. We were relying on someone to have that conversation about their child in the UK, so how could we turn around and say no. We knew it was the right decision for us and for Ben. Ben donated seven of his organs including two of his kidney’s, his pancreas and two sets of heart valves, which were donated to four children and one adult. “They are out there leading better lives now because of our little boy. He always wanted to be a superhero, and he became one in death,” said Bryan. 17 months on and it is still as raw as ever. We do gleam some comfort from it, but I would prefer to see my little boy running around, enjoying life. Bryan said he wanted to tell Ben’s story so that the message gets out there this week, Organ Donor Awareness Week, that it is time to have the conversation with your family about your wishes. “There is no point having the card or instruction on your driving licence unless you have that all important conversation with the people that matter,” said Bryan. Organ Donor Awareness Week takes place from 28 March – 4 April. The Irish Kidney Association is promoting the week and urging people to have a family discussion around the subject of organ donation. You can offer your support for organ donation through donor cards, smartphone app, driver’s licence (code 115) and Freetext numbers. You can text “kidney” to 50300 and €2 will be donated from your mobile phone account to the IKA. Throughout the week, IKA volunteers will be distributing organ donor cards and selling forger-me-not flower emblems (the symbol of transplantation) in cities, towns and villages throughout the country. Email “'Our little boy always wanted to be a superhero and he became one in death'”. Feedback on “'Our little boy always wanted to be a superhero and he became one in death'”.